We visited Heuvelland (Belgium) last weekend. We wanted to have a nice weekend with some friends already in October, but due to the renovation of our living room we postponed our plans for a trip til now. It's a nice and very beautiful, quit area where you can do a lot of walks. The landscape goes up-and-down, so some of the walks demand some effort ! The second day, one of the friends became sick (flew), so we ended our weekend Sunday at noon. But that was not so terrible, we already did the things we wanted to do together. 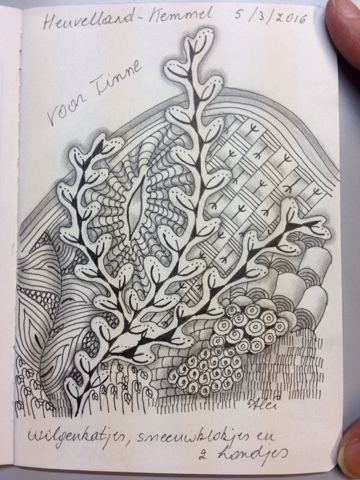 To have some nice memory at our trip and to cheer her up, I made her a zentangle of the walk we did on Saturday.